Soda fountain operators used frozen drink recipes to make what they called a Freeze, a fruity ade drink or a punch in which the shaved ice is allowed to remain when serving. Ice gives the drink a very low temperature, suggesting its name. Old fashioned Freezes were usually served garnished with fresh fruit, a sprig of green mint, and colorful straws. A "Smash" was very similar to a "Freeze" and generally made with fountain syrups of a rich, fruity flavor. Like Freeze recipes, Smash recipes also called for shaved ice and carbonated water. Smashes were traditionally served garnished with a sprig of green mint in thin glasses with straws. Use these old fashioned frozen drink recipes to re-create the nostalgic Freezes and Smashes of the old time soda fountain. You will find these iced beverages delicious and totally refreshing to drink anytime. Crushed fruits served in the following manner are delicious and refreshing: 1-1/2 ounces crushed fruit, juice of half a lemon, sufficient shaved ice. 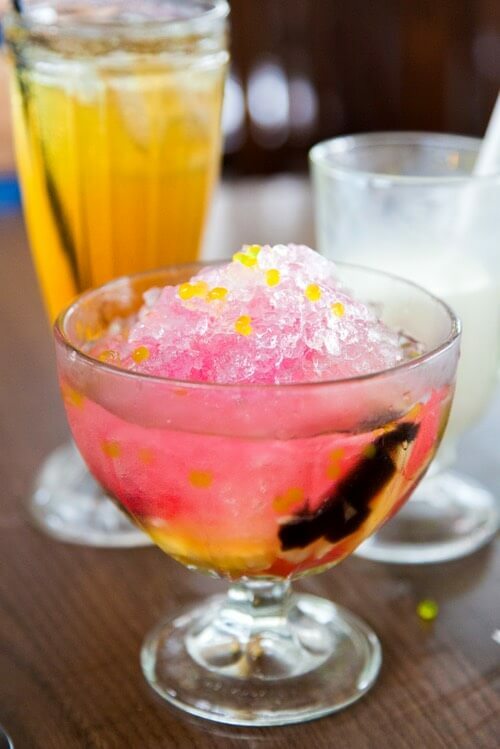 Put the shaved ice in a small glass, add the fruit and lemon juice, stir well, and serve with a spoon and straws. Price—8 ounces, 10 cents. 1 ounce pure grape juice, 1/2 ounce raspberry syrup, 1/2 ounce orange syrup, juice of 1/2 orange, 1/2 glassful fine ice shavings. Fill glass with carbonated water; mix with a spoon. Decorate with fresh mint and seasonable fruits; serve with straws. Price—12 ounces, 15 cents. 1-1/2 ounces vanilla syrup, 1 tablespoonful orange pulp, 1/4 glassful shaved ice. Place all in a 12-ounce soda glass, fill with carbonated water, fine stream, and top off with whipped cream. 1 ounce pineapple syrup, 1 teaspoonful powdered sugar, 1/2 glassful shaved ice. Add some carbonated water, stir vigorously in a shaker, strain into an 8-ounce glass, fill the latter with the coarse stream of carbonated water, stir again, and add a piece of pineapple or some crushed pineapple. Serve with a spoon and straws. One ounce pineapple syrup, half glass shaved ice. Pour into 12-ounce glass, fill with carbonated water, stir, add spoonful of crushed strawberry; top with a slice of orange; serve with straws. Or, pour ounce of strawberry syrup into 8-ounce glass; add large spoonful of either canned or fresh grated pineapple; fill with shaved ice, stir, serve with a spoon. 1 ounce cherry syrup, cracked ice to fill glass, and then pour in grape juice to fill glass. Price—8 ounce glass, 10 cents. 1 ounce pineapple syrup, 1 teaspoonful powdered sugar, 1/2 glass shaved ice. Add carbonated water, shake, strain into 8-ounce glass and fill with carbonated water, coarse stream; stir again, and add a piece of pineapple or some crushed pineapple. Add a small amount of lemon juice. Price—10 ounces, 10 cents. 1 ounce maple syrup, 1/2 ounce vanilla syrup, 1/2 glassful shaved ice. Rub the rim of a tall frappe glass with a piece of orange and dip the rim of the glass into powdered sugar, which will adhere to it. For this frozen drink recipe, shake the syrup and ice, using a heavy glass and a shaker, pour carefully into the frappe glass so as not to wash off the crusting sugar, and fill to about half an inch of the tip with plain soda water. Add a slice of orange. Serve with paper napkin and straws. Price—10 cents.